Source of Support: This work was supported by the Council of Scientific and Industrial Research, New Delhi, India, in form of Senior Research Fellowship., Conflict of Interest: There are no conflicts of interest. Obesity is a major health burden, with associated increased risk of insulin resistance, type 2 diabetes, cardiovascular disease, and cancer, and due to the economic costs to healthcare providers. Mechanisms underlying the progression of obesity and insulin resistance manifest dysfunction of lipid and carbohydrate metabolism. The global prevalence of obesity has nearly doubled since 1980, which is predominantly because of new dietary habits and sedentary lifestyle. Changes in the diet seem to be the major driver of the rise of the global epidemic of obesity during the past 3-4 decades. According to the World health statistics 2012 report of the World Health Organization (WHO), one in six adults is obese (12% of the world's population are considered obese). Being overweight and obese are the fifth leading risk for global deaths, causing at least 2.8 million deaths each year. Pharmacological approaches to weight control have become an overriding priority. Due to obscure aetiology, the treatment of obesity is difficult and challenging. Current trends for obesity management involve multiple pharmacological strategies, including blocking nutrient absorption, modulating fat metabolism, regulating adipose signals, and modulating the satiety centre. Global strategies are focused on dietary and lifestyle modifications, i.e., restricting caloric intake and increasing physical activity to slow obesity development. However, if these strategies fail, antiobesity medication is recommended. Many medications have been used to manage obesity over the years, but most of them are now withdrawn due to their serious adverse effects. Currently, orlistat is the only drug approved by the United States Food and Drug Administration (USFDA) for long term management of obesity. Unfortunately, this drug has adverse gastrointestinal side effects such as steatorrhea. Sibutramine, another antiobesity drug, has been recently withdrawn globally due to the increased incidence of serious, non-fatal cardiovascular events. Disappointing results of pharmacotherapy emphasize the need of other treatment modalities to prevent obesity. Natural plant products are widely used in healthcare or as dietary supplements. Natural products have been used since the inception of human beings on this planet and as a result are almost as old as life itself [Table 1]., Dietary phytochemicals have recently aroused considerable interest as the potential therapeutic agents for health promotion and to counteract obesity. Due to their chemical diversity and ability to act on various biological targets, plant products have long been a thriving source for the discovery of new drugs, and these find use among the most common complementary and alternative medicine systems. Presence of multiple-phytochemical combinations in plant drugs may result in synergistic effect by their action on multiple molecular targets, thus offering advantages over treatments which use a single constituent. Trigonella foenum-graecum L. (Fenugreek; Family: Fabaceae) is an erect annual herb native to the Eastern Mediterranean, Central Asia and Ethiopia, and is extensively cultivated in India, Pakistan, and China. The name fenugreek comes from foenum-graecum, meaning Greek hay, as the plant was traditionally used to scent inferior hay. The name of the genus, Trigonella, is derived from the old Greek name, denoting 'three-angled', referring to the triangular shape of the flowers. The major bioactive constituents in fenugreek seeds include 45-60% carbohydrates; 20-30% proteins; alkaloids, mainly trigonelline, choline, gentianine and carpaine; flavonoids which include apigenin, luteolin, orientin, quercetin, vitexin and isovitexin; amino acids such as 4-hydroxyisoleucine, arginine, histidine, lysine, leucine, L-tryptophan; saponins such as graecunins, fenugrin B, fenugreekine, trigofoenosides A-G; steroidal sapogenins such as diosgenin, yamogenin, tigogenin, neotigogenin; minerals and vitamins; volatile oils (n-alkanes and sesquiterpenes) and fixed oils. Fenugreek seeds have been shown to possess hypoglycaemic, hypolipidemic and antioxidant effects in pre-clinical [Table 2] and clinical studies [Table 3]. In epidemiological studies, polyphenol and flavonoid-rich extract from fenugreek seeds have been shown to possess the hypolipidemic effect due to their antioxidant defence. The presence of proteins and fibre in fenugreek seeds offers high nutritive value as it contains approximate 26% protein and 48% fibre; and might exert a lipid lowering effect. Dietary fibre (galactomannan) in fenugreek seeds are polysaccharides consisting of a mannose backbone with galactose side chains attached at position C6. Galactomannan consist of linear chains of (1-4)-diequatorially linked D-mannose residues, some contain single-sugar side chains of D-galactose attached by (1-6) glycosidic bonds. Galactomannan found in fenugreek seeds form a viscous gel in the intestine and inhibit glucose and lipid absorption. Fenugreek seeds are used as an active ingredient in weight loss and anti-hypercholesterolemic Ayurvedic formulation Ayurslim (The Himalaya Drug Company, Bangalore, India) and Impair-X (Rekindle Health Care Pvt. Ltd., Karnal, India). Taxonomists suggested that as many as 260 species of Fenugreek may exist, of which a total of only 18 species of Trigonella are currently recognized. Various therapeutic benefits of fenugreek seeds have been experimentally evidenced, and the daily dietary intake of fenugreek seeds may provide a higher nutritive value, in addition to high degree of efficacy and safety in obesity treatment. Currently 80% of the world population depends on plant-derived drugs as thefirst line health care because plant-based drugs have no side effects. The traditional system of medicine has a long history of usage in a number of diseases and disorders, but lacks recorded safety and efficacy data. The development of standardized, safe and effective drugs from plant origin can provide economical alternatives for the treatment of obesity. Therefore, there is a need to develop and screen large number of plant extracts and this approach can surely be a driving force for the discovery of antiobesity drugs from medicinal plants. This work was supported by the Council of Scientific and Industrial Research, New Delhi, India, in form of Senior Research Fellowship. Raina GS. Obesity being the major health burden needed to be chased: A systemic review. J Appl Pharm Sci 2011;1:238-45. Kravchun P, Kadykova O, Gabisoniia T. The role of adipokines in formation of lipid and carbohydrate metabolic disorders in patients with cardiovascular disease. Georgian Med News 2012;213:26-31. Swinburn BA, Sacks G, Hall KD, McPherson K, Finegood DT, Moodie ML, et al. The global obesity pandemic: Shaped by global drivers and local environments. Lancet 2011;378:804-14. World Health Organization (WHO); 2012. Available from: http://www.who.int/mediacentre/factsheets/fs311/en/index.html. [Last accessed on 2015 apr 26]. Padwal RS, Majumdar SR. Drug treatments for obesity: Orlistat, sibutramine, and rimonabant. Lancet 2007;369:71-7. World Health Organisation (WHO); 2007. Available from: http://www.who.int/dietphysicalactivity/strategy/eb11344/en/. [Last accessed on 2015 apr 26]. Kang JG, Park CY. Anti-obesity drugs: A review about their effects and safety. 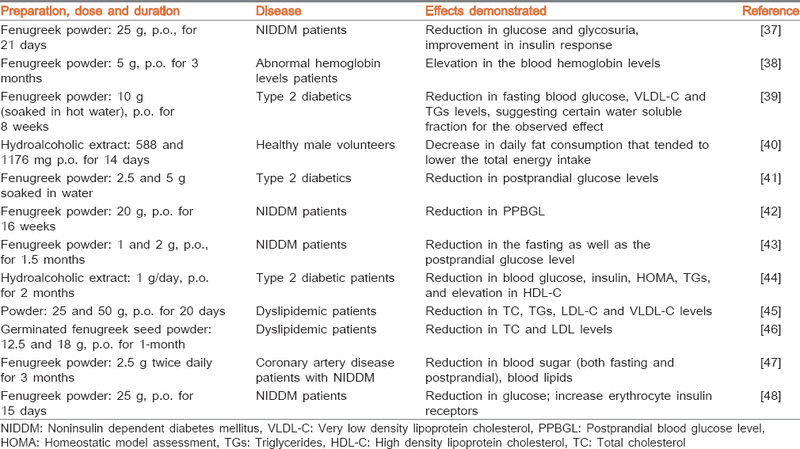 Diabetes Metab J 2012;36:13-25. Chawla R, Thakur P, Chowdhry A, Jaiswal S, Sharma A, Goel R, et al. Evidence based herbal drug standardization approach in coping with challenges of holistic management of diabetes: A dreadful lifestyle disorder of 21st century. J Diabetes Metab Disord 2013;12:35. Latha BP, Reddy IR, Ismail SM, Vijaya T. Medicinal plants and their derivatives as potential source in treatment of obesity. Asian J Exp Biol Sci 2010;1:719-27. Verma RK, Paraidathathu T. Herbal medicines used in the traditional Indian medicinal system as a therapeutic treatment option for overweight and obesity management: A review. Int J Pharm Pharm Sci 2014;6:40-7. González-Castejón M, Rodriguez-Casado A. Dietary phytochemicals and their potential effects on obesity: A review. Pharmacol Res 2011;64:438-55. Bhutani KK, Gohil VM. 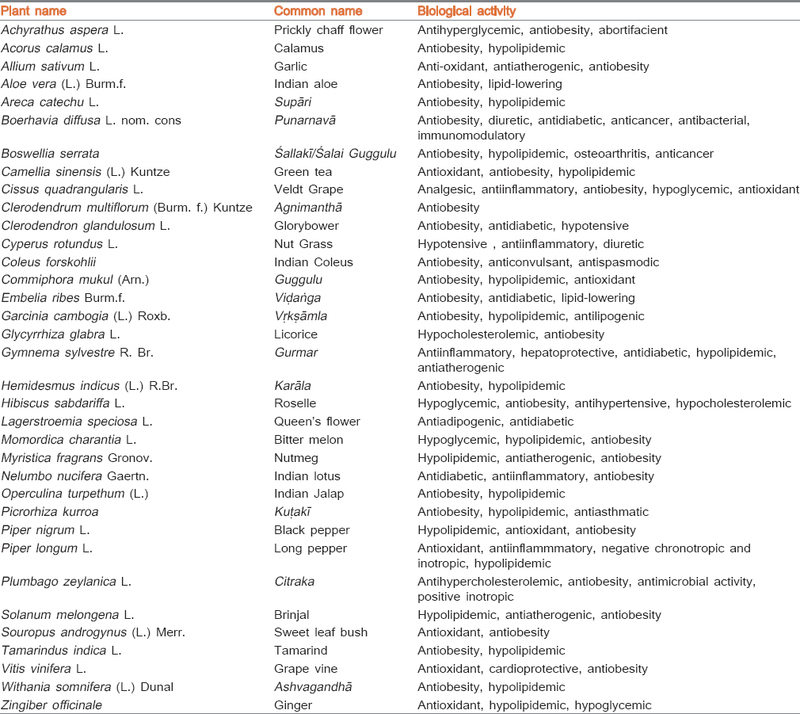 Natural products drug discovery research in India: Status and appraisal. Indian J Exp Biol 2010;48:199-207. Morton JF. Mucilaginous plants and their uses in medicine. J Ethnopharmacol 1990;29:245-66. Snehlata HS, Payal DR. Fenugreek (Trigonella foenum-graecum L.): An overview. Int J Curr Pharm Rev Res 2011;2:169-87. Moradi KN, Moradi K. Physiological and pharmaceutical effects of Fenugreek (Trigonella foenum-graecum L.) as a multipurpose and valuable medicinal plant. Glob J Med Plant Res 2013;1:199-206. Chopra RN, Nayar SL, Chopra IC. Glossary of Indian Medicinal Plants. Vol. 10. New Delhi, India: Council of Scientific and Industrial Research; 1986. Petit P, Sauvaire Y, Ponsin G, Manteghetti M, Fave A, Ribes G. Effects of a fenugreek seed extract on feeding behaviour in the rat: Metabolic-endocrine correlates. Pharmacol Biochem Behav 1993;45:369-74. Warrier PK. Ocimum basilicum Linn. In: Warrier PK, Nambiar VP, Ramankutty C, editors. Indian Medicinal Plants. Madras, India: Orient Longman Limited; 1995, p. 160-3. Kirtikar KR, Basu BD. Indian Medicinal Plants. 9th ed. Dehradun, India: International Book Distributors; 2003. Prajapati ND, Purohit SS, Sharma AK, Kumar T. A Handbook of Medicinal Plants: A Complete Source Book. Jodhpur, India: Agrobios Publisher; 2003. p. 523. Belguith-Hadriche O, Bouaziz M, Jamoussi K, Simmonds MS, El Feki A, Makni-Ayedi F. Comparative study on hypocholesterolemic and antioxidant activities of various extracts of fenugreek seeds. Food Chem 2013;138:1448-53. Hamden K, Jaouadi B, Carreau S, Bejar S, Elfeki A. Inhibitory effect of fenugreek galactomannan on digestive enzymes related to diabetes, hyperlipidemia, and liver-kidney dysfunctions. Biotechnol Bioprocess Eng 2010;15:407-13. Ghorbani A, Hadjzadeh MA, Rajaei Z, Zendehbad SB. Effects of fenugreek seeds on adipogenesis and lipolysis in normal and diabetic rats. Pak J Biol Sci 2014;17:523-8. Ali NM, Zamzami MA, Khoja SM. Regulation of hepatic and mucosal 6-phosphofructo-1-kinase activity by Trigonella foenum-graecum Linn (fenugreek) seeds of streptozotocin-induced diabetic rats. J Diabetes Res Clin Metab 2013;2:18. Sankar P, Subhashree S, Sudharani S. Effect of Trigonella foenum-graecum seed powder on the antioxidant levels of high fat diet and low dose streptozotocin induced type II diabetic rats. Eur Rev Med Pharmacol Sci 2012;16 Suppl 3:10-7. Hamza N, Berke B, Cheze C, Le Garrec R, Umar A, Agli AN, et al. Preventive and curative effect of Trigonella foenum-graecum L. seeds in C57BL/6J models of type 2 diabetes induced by high-fat diet. J Ethnopharmacol 2012;142:516-22. Belaïd-Nouira Y, Bakhta H, Bouaziz M, Flehi-Slim I, Haouas Z, Ben Cheikh H. Study of lipid profile and parieto-temporal lipid peroxidation in AlCl3 mediated neurotoxicity. Modulatory effect of fenugreek seeds. Lipids Health Dis 2012;11:16. Xue W, Lei J, Li X, Zhang R. Trigonella foenum graecum seed extract protects kidney function and morphology in diabetic rats via its antioxidant activity. Nutr Res 2011;31:555-62. Sakr SA, El-Shenawy SM, Al-Shabka AM. Aqueous fenugreek seed extract ameliorates adriamycin-induced cytotoxicity and testicular alterations in albino rats. Reprod Sci 2012;19:70-80. Sushma N, Devasena T. Aqueous extract of Trigonella foenum graecum (fenugreek) prevents cypermethrin-induced hepatotoxicity and nephrotoxicity. Hum Exp Toxicol 2010;29:311-9. Vijayakumar MV, Pandey V, Mishra GC, Bhat MK. Hypolipidemic effect of fenugreek seeds is mediated through inhibition of fat accumulation and upregulation of LDL receptor. Obesity (Silver Spring) 2010;18:667-74. Hannan JM, Ali L, Rokeya B, Khaleque J, Akhter M, Flatt PR, et al. Soluble dietary fibre fraction of Trigonella foenum-graecum (fenugreek) seed improves glucose homeostasis in animal models of type 1 and type 2 diabetes by delaying carbohydrate digestion and absorption, and enhancing insulin action. Br J Nutr 2007;97:514-21. Bhatia K, Kaur M, Atif F, Ali M, Rehman H, Rahman S, et al. Aqueous extract of Trigonella foenum-graecum L. ameliorates additive urotoxicity of buthionine sulfoximine and cyclophosphamide in mice. Food Chem Toxicol 2006;44:1744-50. Vats V, Yadav SP, Grover JK. Effect of T. foenumgraecum on glycogen content of tissues and the key enzymes of carbohydrate metabolism. J Ethnopharmacol 2003;85:237-42. Zia T, Hasnain SN, Hasan SK. Evaluation of the oral hypoglycaemic effect of Trigonella foenum-graecum L. (methi) in normal mice. J Ethnopharmacol 2001;75:191-5. Sharma RD. Effect of fenugreek seeds and leaves on blood glucose and serum insulin responses in human subjects. Nutr Res 1986;6:1353-64. Doshi M, Mirza A, Umarji B, Karambelkar R. Effect of Trigonella foenum-graecum (Fenugreek/Methi) on hemoglobin levels in females of child bearing age. Biomed Res 2012;23:47-50. Kassaian N, Azadbakht L, Forghani B, Amini M. Effect of fenugreek seeds on blood glucose and lipid profiles in type 2 diabetic patients. Int J Vitam Nutr Res 2009;79:34-9. Chevassus H, Molinier N, Costa F, Galtier F, Renard E, Petit P. A fenugreek seed extract selectively reduces spontaneous fat consumption in healthy volunteers. 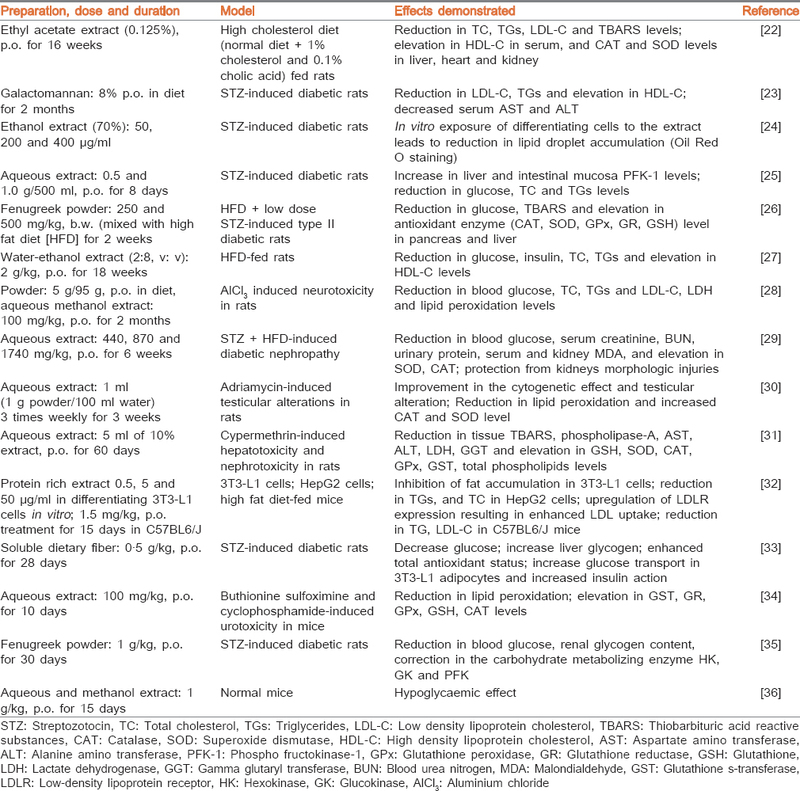 Eur J Clin Pharmacol 2009;65:1175-8. Bawadi HA, Maghaydah SN, Tayyem RF, Tayyem RF. The postprandial hypoglycemic activity of fenugreek seed and seeds' extract in type 2 diabetics: A pilot study. Pharmacogn Mag 2009;4:134-8. Ismail MY. Clinical evaluation of antidiabetic activity of Trigonella seeds and Aegle marmelos leaves. World Appl Sci J 2009;7:1231-4. Kochhar A, Nagi M. Effect of supplementation of traditional medicinal plants on blood glucose in non-insulin-dependent diabetics: A pilot study. J Med Food 2005;8:545-9. Prasanna M. Hypolipidemic effect of fenugreek: A clinical study. Indian J Pharmacol 2000;32:34-6. Sowmya P, Rajyalakshmi P. Hypocholesterolemic effect of germinated fenugreek seeds in human subjects. Plant Foods Hum Nutr 1999;53:359-65. Bordia A, Verma SK, Srivastava KC. Effect of ginger (Zingiber officinale Rosc.) and fenugreek (Trigonella foenumgraecum L.) on blood lipids, blood sugar and platelet aggregation in patients with coronary artery disease. Prostaglandins Leukot Essent Fatty Acids 1997;56:379-84. Raghuram TC, Sharma RD, Sivakumar B, Sahay BK. Effect of fenugreek seeds on intravenous glucose disposition in non-insulin dependent diabetic patients. Phytother Res 1994;8:83-6. Doyle JP, Lyons G, Morris ER. New proposals on "hyperentanglement" of galactomannans: Solution viscosity of fenugreek gum under neutral and alkaline conditions. Food Hydrocoll 2008;23:1501-10. Acharya SN, Thomas JE, Basu SK. Fenugreek: An "old world" crop for the "new world". Biodiversity 2007;7:1-4. Pandey M, Debnath M, Gupta S, Chikara SK. Phytomedicine: An ancient approach turning into future potential source of therapeutics. J Pharmacogn Phytother 2011;3:27-37.